(AP) The Grand Forks Herald's editorial voice went from "shrill to sympathetic" after the 1997 Red River flood disaster, the newspaper's publisher and editor says. "The culture of the newspaper has changed enormously," Mike Jacobs said. "We're much more community friendly now." 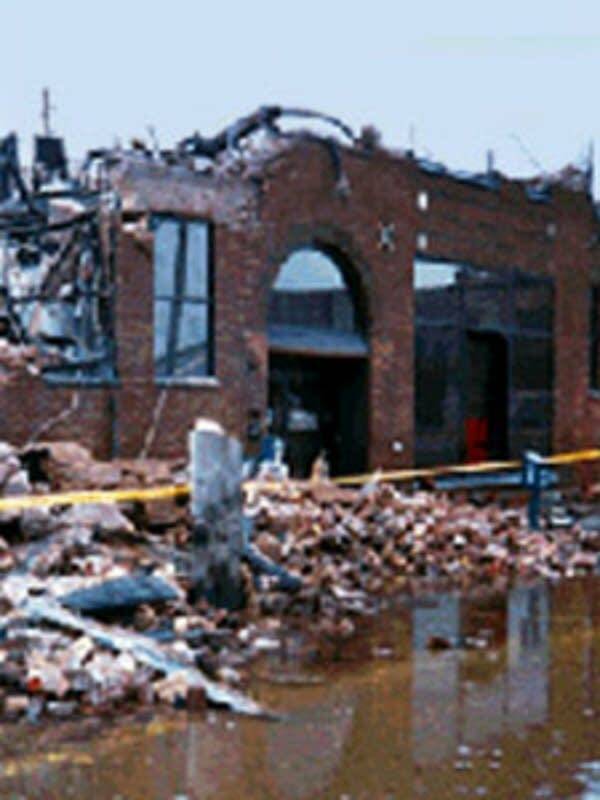 The Herald won the Pulitzer Prize for public service for its work in covering the flood and fire that devastated downtown Grand Forks, including the newspaper's offices, in April 1997. Papers were dropped by plane or trucked to towns where displaced residents were refugees. The Herald was published at temporary sites for more than a year after the ordeal, but it never missed an edition. "I'm glad to have experienced it, I wouldn't want to repeat it and I wouldn't wish it on anybody," Jacobs said of the flood and fire. "You learn a lot from that kind of crisis." The Herald ran the banner headline: "Come Hell and High Water" during the disaster. It has become the unofficial motto of the newspaper, which rebuilt its offices in downtown Grand Forks after the water receded. The $13 million remodeling project was aimed at making a statement, Jacobs said. "The city needed a business leader to carry the message that the city could - and would - be rebuilt," Jacobs said. A 97-foot clock tower now tops the newspaper's offices downtown, reflecting the year of the disaster. A 54-foot tall entrance rotunda symbolizes the high-water mark of the flood, and 19-point sundial patterns on the floors signify April 19, 1997, the day much of the city was evacuated. Many of the more than 50 newsroom employees, who suffered their own personal losses in the flood, grew closer as a result of the flood, said Kevin Grinde, the newspaper's managing editor. "We were a tight-knit group at the time," he said. The newspaper has a daily circulation of about 30,000, though the circulation has dropped slightly in the years after the flood, Jacobs said. The Herald also went through a round of job cuts and was put up for sale in 2006 when McClatchy Co. included it among a dozen former Knight Ridder Inc. newspapers to be sold because they were not considered to be in rapidly growing markets. The Herald was bought by Forum Communications Co., the owner of its competitor, The Forum in Fargo. Since the flood, about half the newsroom staff have moved on, some able to parlay their participation in winning the Pulitzer Prize to jobs at larger newspapers, Grinde said. The Herald, which celebrated its 125th birthday in 2004, now has about 200 employees, Jacobs said. The Pulitzer has helped lure applicants, Grinde said. Grinde and sports editor Kevin Fee went to Biloxi, Miss., in 2005 to help the Sun Herald publish its daily paper in the wake of Hurricane Katrina. Staff reporters also were sent to help publish newspapers for then owner-Knight Ridder during Hurricane Rita. "We've all been there and done that, and since we had the experience, we were able to jump right in," Grinde said. Fee said the news staff at the Sun Herald welcomed the help. "It was a little easier to communicate with them because they knew you had been there before," Fee said. "The Grand Forks people were just an asset that we could not have done without," said Kate Magandy, city editor for the Sun Herald. "They knew what it was like and what needed to be done." "These folks came in and not only gave our staff some much-needed time to get their lives in order but also helped get the news out," Magandy said. "We couldn't have done it without them."